I Know I Said I Wouldn't Give Teachers Advice, But . . .
During the #RedforEd walkouts, I wrote a post saying educators were doing just fine without my advice, and this retired teacher wasn't about to "old man" them. Yeah, well. Don't call this advice then. Call it what I would do if I were in the teachers' place. Except it might not be what I would do if I were in their place. So let's call it a suggestion worth every penny the teachers are paying for it. I would love to see teachers around the state demand that the 9+1 percent pay hike the legislature built into the budget be shared with everyone in the school community, except administrators, who already receive a reasonable salary. Would I agree with myself if I were currently an Arizona teacher looking at a raise which doesn't bring me up to the salary I should be making, and doesn't take into consideration the reparations (raise-parations?) I deserve for the years my wage was way below the national average? I don't know. I might have to be talked into it, and even then . 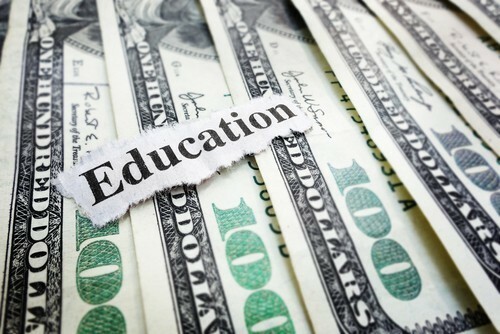 . .
With all that in mind, here's why I think teachers should share the raise, coming from someone who doesn't have a dog-eared dollar bill in the hunt. Teacher wages are bad. Support staff wages are worse. While the legislature earmarked some new money for teachers, it cheated non-teaching staff out of the much-needed raise which was one of the #RedforEd demands. If teachers sacrificed some of their raise to make up for the legislature stiffing the rest of the staff, it would send a powerful message. It would say, "We're demonstrating the respect we have for the people who work beside us. We understand the value they add to our children's educations." The move would foster unity across the school community in the struggle to achieve full funding for Arizona education. If teachers are willing to share the raise with other staff members, it encourages everyone to share the burden during the political campaign season, at voting time and, if necessary, during a walkout next year. Arizona has about 50,000 teachers. We have a similar number of support staff, maybe a few thousand less. That's a pool of nearly 100,000 adults to draw strength from, on top of parents with school-aged kids and other supporters of public education. There are complications, of course. If Tucson Unified unilaterally lowers teacher raises by sharing them with support staff as Superintendent Trujillo suggests but other neighboring districts go with the full 10, it could make the Tucson district less able to compete for new teachers. An uneven response from districts creates a problem. No easy answers here. One last thing. Superintendent Trujillo says he wants the raise to be shared. But if I understand district contracting procedure correctly, the teacher's bargaining unit—the TEA in this case—jostles with the district's bargaining team to come up with a contract they can agree on, then the school board has to OK it (I'm not sure whether TEA needs to go back to the teachers for a vote of approval as well). So while Trujillo can state his preferences, it's up to the teachers to decide whether sharing the raise is acceptable and the board to agree. Actually, if teachers decide they want to share the raise, the TEA can put a lower compensation package into its contract proposal with the understanding that the remaining funds goes to the salaries of the rest of the staff.